I know, this is at least my 3rd mention of brownies this month. I'm sorry, apparently that's all I can bake these days! What can I say, they are quick and easy to make and I clearly love them. 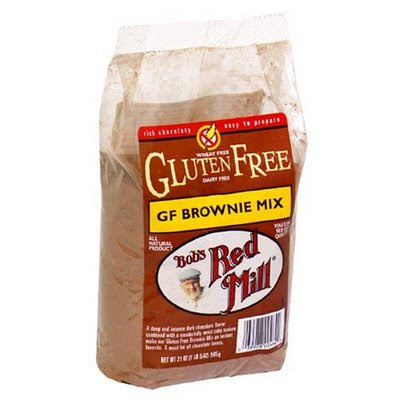 Last night after I failed at tried making salmon cakes, I decided to whip up the Bob's Red Mill GF Brownie mix that I had received in my goodie bag at the cooking spree. So far I have made them from scratch, tried the Trader Joe's mix, tried Foods by George pre-made version, and now trying Bob's Red Mill. This mix required one and half sticks of melted butter (!!) and in the finished product you can definitely taste it. 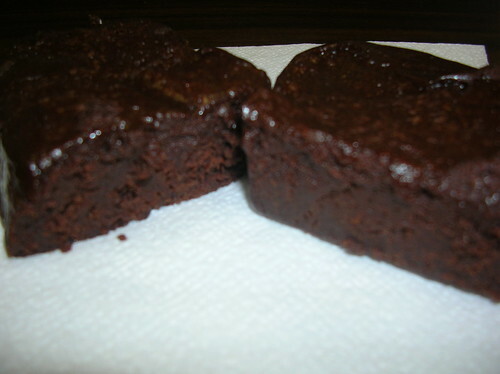 I like these brownies, but they're more like cake. I'd definitely put frosting on them and serve them up that way. As far as brownies go, I'm still sticking with the from-scrath version or Trader Joe's mix. Here's a rather unflattering picture of them. See how dense they are? These two were from the center of the pan, definitely more gooey than the edges, but still like cake. I just ate one, I don't like the after-taste. I won't buy this mix again. Sorry Bob! But hey, it's FRIDAY! Three cheers for the weekend. Great blog! Namaste makes a good brownie mix.